The Statue of the American Revolutionary War Hero, General Comte de Rochambeau. On August 12th, 2016, it was the day of my and my mom’s birthday, so we’ve decided to go to my favorite place Washington D.C. with our family. I have taken this picture of my mother standing near the statue of the American Revolutionary War Hero, General Comte de Rochambeau. First of all, I really thought this statue was very fascinating, because the street we reside is named after General Rochambeau and therefore, I wanted to know more about him instantly. Though, the statue had mere amount of information about General Rochambeau such as his birthday and date of his death, also the date when they placed this statue. 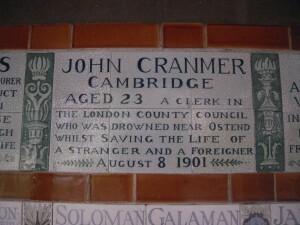 Furthermore, I went to do some research online to know more about him. General Comte de Rochambeau was born in 1725 and died in 1807. His statue was placed in Lafayette Park, Washington, D.C., and the statue was a significant symbol of the official relations between France and the United States. 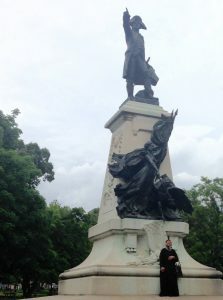 According to the site, “France wished to erase any perception arising from the war that it held anti-American sentiments.” “Rochambeau Statue.” National Parks Service. U.S. Department of the Interior, n.d. Web. 25 Mar. 2017. This statue was built in 1902 and finally on May 24, 1902 President Theodore Roosevelt and the congress and others have dedicated the Rochambeau statue to be placed at the southwest corner of Lafayette Square. In all, I was much honored to go to my favorite place Washington D.C., I have seen the beautiful White House and several statues and amongst all I dearly liked General Rochambeau’s statue. His statue represented peace and harmony amongst two strong nations France and America and it also showed that America is very welcoming to all nations by placing this statue of Rochambeau. This is one of the few buildings of New York City, that I believe to be really unique and significant. 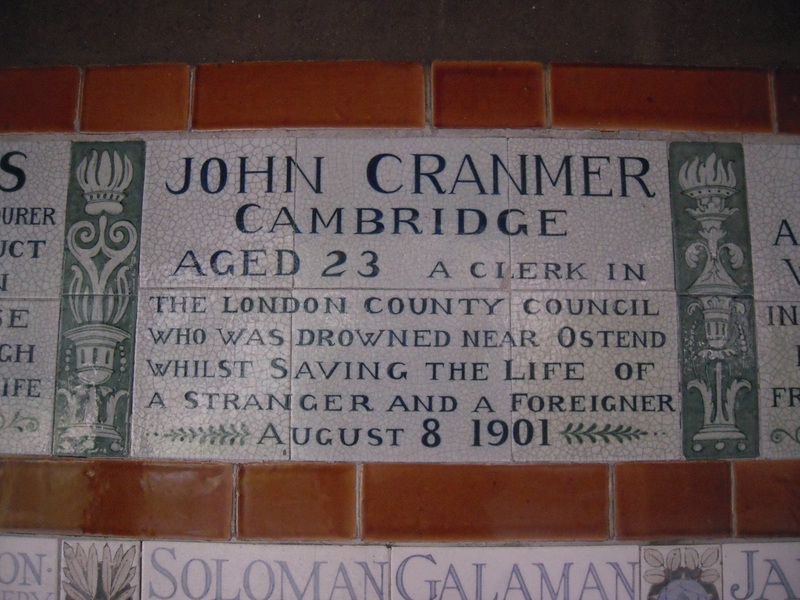 I have visited this place a couple of times as well. I last took this picture on December 26th, 2016. The Monumental Brooklyn War Memorial represents the 300,000 American men and women of the borough of Brooklyn who fought in the Second World War (1941-1945), and suffered a lot also died, so therefore this building was dedicated to them and to inspire the future generation of Brooklynites. Outside of the building those two statues are fringed which represents a men warrior and a female with a child symbolizing victory and family. I first saw this building in 2013 while strolling from New York City College of Technology to go to the Brooklyn Bridge. 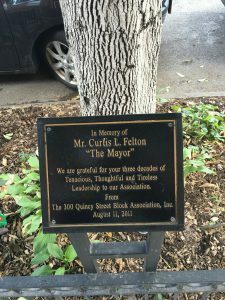 This Monument is located inside of the Brooklyn Historical Park (128 Pierrepont St.). This park is really big and wonderful to visit mostly during the summertime, since they have a lot of seats outside for people to get fresh air and kids can play baseball in the center of the park plus they can go inside of the beautiful Historical Museum. The name of the sculptor who sculpted the statues are Charles Keck and it was erected in 1951. In all, I really found this place to be really amusing and significant to visit, even though I don’t reside in Brooklyn, N.Y., but I do attend a college in the borough of Brooklyn also it really inspired me to be more patriotic knowing that all these men and women who fought for their country America; and sacrificed their lives for the life I am living today free and peaceful. I am honored and really happy that I have gotten a chance to see this place, and write about it as well, and I would recommend others to definitely visit this place. 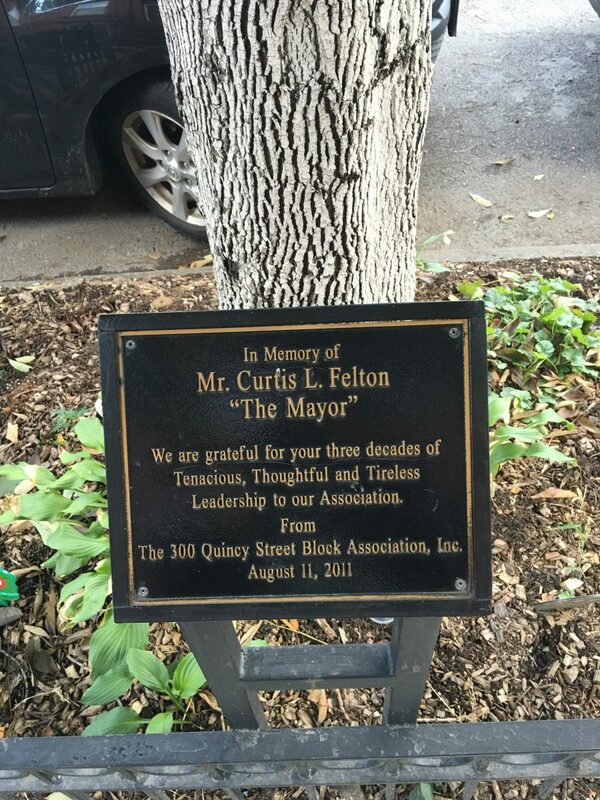 I found this small memory of Mr. Felton in Brooklyn, New York in the area of Bedford Stuyvesant from the 300 Block Association, he was someone that was held in high regard while living on this block since 1963. He was a member of the block association for 15 years and he was linked with the 79th police precinct. He believed in working with the police department to help control crime in the Bed-Stuy. In this area of Brooklyn working with the police department has become a way of life. While walking around these blocks I noticed a lot of friendly exchanged between the police officers that walk the streets and the homeowners outside early weekend morning sweeping there front yards. I can’t help but to think that this relationship started way before I ever walked these streets. I feel grateful for Mr. Felton from creating a better sense of community between two forces of homeowners and the police department. Now at these meeting his sense of community is still apart of the monthly meeting, the police officers attend the meeting and give us guidelines and insure that they are here to help in anyway that they can. Read how my Senior Seminar students made art to encourage deep thought and to appreciate the value of collaboration in The Dearly Departed. Welcome to our Open Lab class!